I've always had a crush on the West End in Winston-Salem. The quaintness of the neighborhood, artsy local shops and handful of dining spots - which has recently increased by a few - has long been an infatuation of mine. Hoots Roller Bar and The Porch have nestled into an unassuming, less than enticing corner off Northwest Boulevard - both are in the same building as The Olio glassblowing studio! What started as a blog, "Dinners on The Porch," is now a full-fledged restaurant. It's casual, family-friendly, and the Tex-Mex offerings are something Winston has been needing for a while. After my trip to Houston this spring, I was desperate to find something that resembled that delicious fare! The Porch nailed it. Orders are placed at the counter, but servers are consistently checking in with tables on the floor. The Cantina Turner is a tasty sip. Served in a champagne flute, Bacardi Rum, Habanero Tabasco, Grapefruit Juice, Ginger Syrup, Cointreau and Champagne comes with a warning label: "Hot Stuff!" It warmed the back of my throat nicely, but wasn't too hot to enjoy by any means. Chips and Salsa are $3, but refills are free. And you'll want several of the spicy, fresh salsa. Easily one of the best things I've eaten all year, the Spicy Tropical Quesadilla was a special that evening. It's packed full of plump, pink Shrimp, Pineapple, Caramelized Onions and Monterrey Jack Cheese. The sweetness of the shrimp, pineapple and caramelized onions is absolute perfection. The richness of the cheese makes it extra indulgent. I'm so impressed with how well the shrimp was cooked - it's usually cooked to a rubbery death when it's served IN something, but this was so fresh! It wouldn't surprise me if it was from Sea Products down the street! 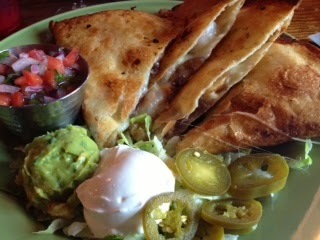 The Quesadilla is served with chunky Guacamole - one of the best restaurant varieties I've had. Pico de Gallo is bursting with fresh ingredients. Sour Cream, Pickled Jalapenos and Shredded Lettuce round out this plate of heaven. Seriously, this needs to be added onto the daily menu or I'll have a fit. Tex-Mex take on Bahn Mi! The Texas Bahn Mi differs from the traditional Vietnamese Sandwich, being that it's served on Spanish Torta bread as opposed to the usual French baguette. 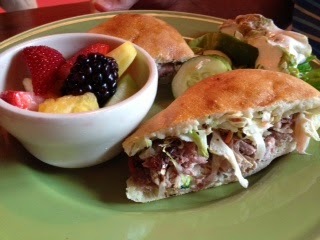 Shredded, smoked Pork practically falls out of the bread (also available with Tofu! ), a Cilantro Garlic Mayo cools you down, and Pickled Vegetables are a nice crunch. A side salad and fruit cup accompany this plate. Burrito Bowls are served with your choice of protein - Avocado being one of them! - and is filled with Jasmine Rice, Pinto Beans, Salsa Verde (which is more like if traditional Salsa Verde and Sour Cream had a baby), Queso, Pickled Jalapenos and Roasted Veggies. There's not much you can disagree with here. So many menu items at The Porch caught my eye. It was nearly impossible to decide what to get. People are looking for this place to succeed, and so am I. Based on my evening here, I'll be driving to Winston much more frequently to come back.